We are off to a great start in Forest Class! Our theme this year is homes, spaces and imaginary places and we have wasted no time inviting your child to be a part of this theme. Every student, teacher and visitor is welcomed into our classroom space by an imaginative display at our entryway. 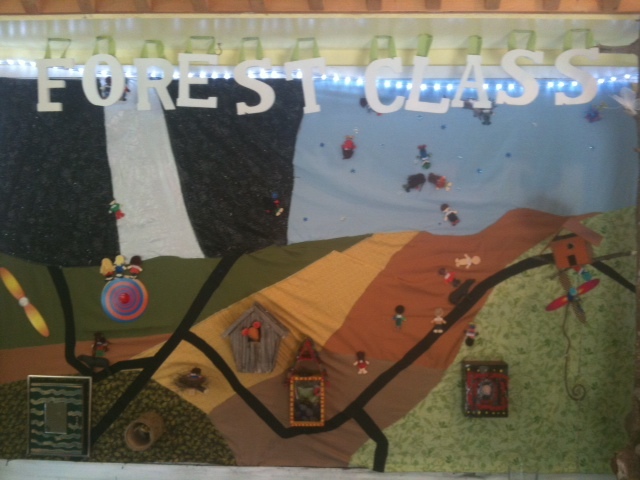 This imaginary world came to life as each child in Forest Class created a wooden figure of themselves and placed it onto the landscape. We have enjoyed getting to know your child this week. Our time has been spent creating art displays for the classroom, listening to stories, playing games, and working together to create a safe and fun classroom community. Today we worked together to create a classroom contract with rules the children felt would keep our classroom safe and fun. The children are excited to make the contract official by adding their signature tomorrow. Tomorrow is also an exciting day because it is the GRAND OPENING of our classroom library! All week students have been longingly looking at the books just beyond the blue ribbons stretched across our classroom library. Tomorrow morning we have a special guest who will come to our classroom and cut the ribbon to launch a new school year of reading. We will post some pictures from our celebration, so make sure to check back.